From struggling as a beginning writer and learning everything he could squeeze out of books and articles on creativity, writing, and publishing, Greg Lilly stepped his way from technical trainer and infrastructure architect of a major corporation to magazine editor, fiction author and small press publisher. The shift from the Information Technology world to a Writer’s Life was a 40th birthday re-invention with some squeaks and bumps along the way. That perilous journey led Greg to develop and conduct several acclaimed workshops and seminars for aspiring writers. He shares his experiences and techniques – things that worked, not in academia or in New York City, but in the real world of freelancing and query letters and book signings. The kernel of this book came from requests of those workshop handouts and notes. 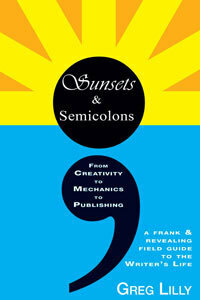 This is one writer’s life from creativity to craft, staring at sunsets to sweating over semicolons. This is a field guide to navigating the Writer’s Life. This guide does not teach how to write, but gives tips from the trenches of writing: developing an idea so it makes it to the page; overcoming writer’s block when the words don’t flow; strengthening the pace of the manuscript so readers are breathless; and finally, how to sell your manuscript to a publisher — from an insider’s viewpoint. Discover advice from testing an idea for a novel to perfecting a query letter that sells that novel to a publisher – in a frank and revealing Field Guide to the Writer’s Life. A complete guide, takes the reader from a vague idea to a finished, ready-to publish manuscript. Whether one can write full-time or simply wants to use writing as one part of an active lifestyle, Time To Write delivers the practical steps necessary to turn the dream of becoming a writer into reality. Click Book Cover for purchase link. 2019 Returning and New Member Form - Click here. Not too late to renew your membership--and it's always a good time to join CBW! Winners to be announced in May for the 2019 Keating Award Competition! Sun Apr 14, 1 PM Open Mic program at Mathews Memorial Library. Free and open to the public. Coffee, tea, and light refreshments will be served.Writers who would like to read their work should arrive at 1PM and sign up to be included on the program. Readers will be limited to either prose up to 2,500 words, five poems of no more than 50 lines each, or five haiku.For more information, call 804-725-9843. Tues Apr 16 at 1 PM: Nate Hoffelder on "The Five Bios You Need on Social Media" presented by CBW at the Essex Library in Tappahannock. Wed Jun 19 at 5:30 PM CBW Dinner Meeting, Gloucester Point with Abigail Putnam on writing short stories. Presentation of Keating Award prizes! CBW can now accept business card, quarter, half and full page ads in the newsletter. For information and payment form, click here. Check out Critique Groups & Networking Page for other events. Books by CBW Members - Check out books published by CBW members at our Members' Bookstore! Visit our Why Join page now to learn more or our Membership and Dues page to become a member today! Chesapeake Style Magazine offers Books in Style reviews for authors who are members of CBW or who regularly attend one of its critique groups. Click here for issues of Bay Writers News back to 2010! Founded in 1991, Chesapeake Bay Writers is a chapter of the Virginia Writers Club. CBW serves writers from the Middle Peninsula, the Northern Neck and Williamsburg and adjacent areas. Chesapeake Bay Writers is a chapter of the Virginia Writers Club. Click on the link for information on upcoming events and membership in the statewide Virginia Writers Club. This is a separate membership in addition to CBW. Copyright ©2019 Chesapeake Bay Writers. All Rights Reserved.